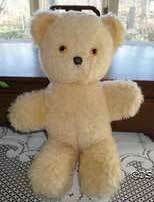 Old bears made by the Pedigree Soft Toy Company begin in 1937 when the company was first formed. The Pedigree Soft Toy company was born from a previous company, Lines brothers who at one point owned the largest physical company in the world with their 27 acre factory in the UK. However the Pedigree brand really boomed during the 1950's and 60 and this is when most of their teddy bears were made and so these are the ones which are most often found and collected. Please click on the Images for further details. Plastic amber and black eyes were mainly used. A few later bears had blue glass eyes. A few bears have a bell in their ear or a musical box inside. After 1960, synthetic materials became the fashion and wash ability was of high importance to the consumers at the time. Foam rubber filling became popular too for this reason. At this time new designs were also introduce and some Pedigree bears designed by their designer, Ann Wood, display the new look of the time, i.e. large head in relation to the small body. Lines Brothers (the main company behind Pedigree Soft Toys) registered their first trade mark after the First world War. The trade mark was called Triang Toys. 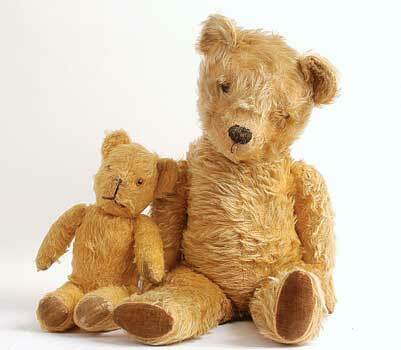 Pedigree teddy bears carrying a label which says "Made in England" dated the bear to pre 1955. After this time all bears were made in Ireland.